Check out the Casinos on the sides, and see the Welcome Bonuses we offer. You are one click away from claiming them. The jungle drums are echoing in the distance! Something mystical and unknown crawls your way! A Dark-themed slot game that is quite an interesting and innovative one is presented and it has something that propels it to the very top of the list. An Innovative game developed by Playtech that will trigger the fear of the unknown behind the bushes! Ugga Bugga slot game offers many positive features. It comes in the shape of three reels and 10 paylines, a chance for you to win the Max Win which is 1000 and fantastic other prizes with the denomination range being £0.10 up to £250.00. The RTP that Ugga Slot is offering demonstrates why Playtech is one of the best developers and why people love this game. 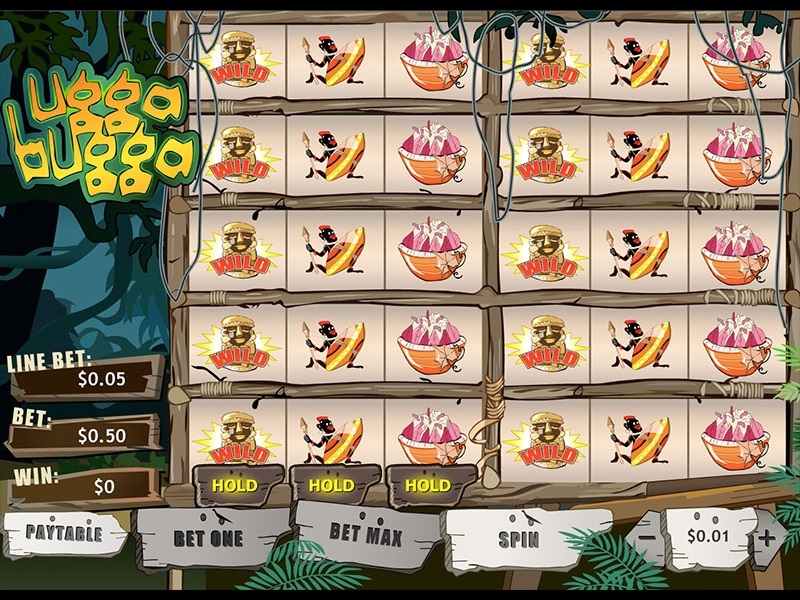 It has a fantastic 99.07% RTP, one of the best in the online slots community. Let’s see what this game has prepared for us, and click the link on the sides and claim some of the free spins and bonuses that we offer. A pretty sharp design that will make everyone fall in love with the game, and the fact that it is made inspired by a land-based slot machine it makes the game even more desirable. As soon as you open Ugga Bugga online video slot game, you will see how there are multiple reels in an order like never seen before. We will explain how it all works below. The game has a dark, scary theme positioned deep inside the dark woods. The reels take a big part of the screen, but on the left side, the dark forest is visible. All the options that this game offers are positioned under the reels on wooden plates. The graphics are extremely good and colourful with the symbols making it even better. The music will make your skin crawl as it is quite intense and decants the situation as much as it is able to, placing every player on its toes and looking behind their backs constantly. There is an interesting set of symbols which are represented by different pictures related to the theme like bongos, a house in the words, a skull, warriors, hits, and masks. The Golden Eagle is the Wild Symbol of this game and it is used as a substitute for all the normal symbols of the game. The Warrior symbol does something interesting – it expands on the same position on all 10 reels, increasing the chance of a win! Give it a try. Now comes the interesting part. Ugga Bugga slot is three reels 10 paylines online video slot, but it can’t end here. Each payline has its own slot, and when you look at the game closely, since each of those slots turns on its own, there are actually 10 slots with one payline on them. This might be a little bit tricky and hard to handle at the beginning, but trust me, after few spins and after you get used to the mechanics, it’s a pretty awesome game. 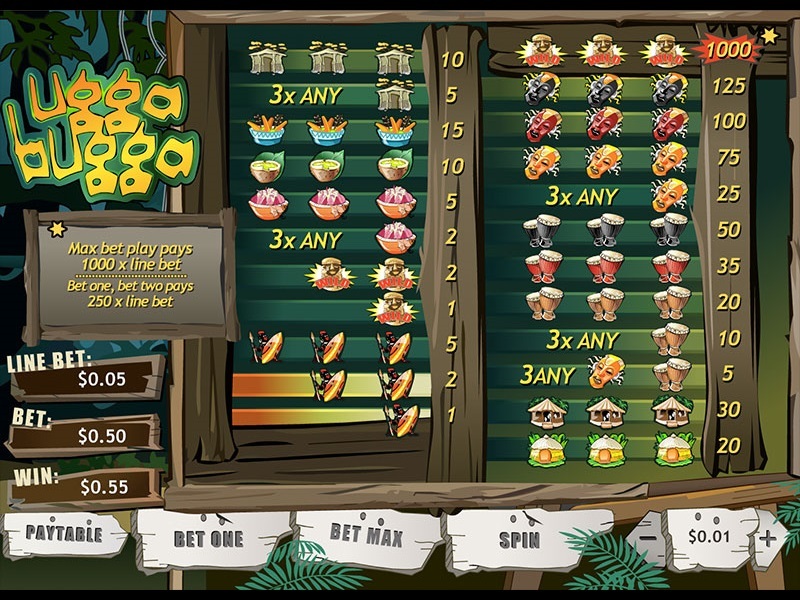 To start playing the game, you need to select a casino where you will play Ugga Bugga slot. The casinos are located on the sides of this review, and they will offer you different and unique welcome bonuses that will facilitate your way to the most lucrative wins of the game. Choose carefully, as you will spend a big amount of time on the pages of the casino. Once that’s done, it is time to set the denomination of the slot. You can play with a denomination from £0.01 all the way up to £250 per single spin, and the Max Win that you can acquire in the game will be a multiplier of x1000 from your stake. This is achievable when you click on the Bet Max button, as it will set the maximum coin value, activate all the pay lines and set the highest denomination. You can also choose the “Bet One” option, which is basically playing with a coin value of one, totally opposite of Bet Max. We warn you to be cautious when playing the Beet Max feature, as it can lose all of your money pretty fast when you are not careful. Either come up with a limit or a plan for your money or neglect this feature completely. On the other hand, the Auto Play is here to give you a rest and spin the reels of the game by itself, where all you need to do is set the denomination and the number of spins you wish the game to spin. You can always change your mind and cancel the feature. Apart from these options, you can manually adjust the denomination by your desire. Don’t get scared of the sound hitting spin! As an addition, there is a Hold option that comes again pretty often, and it will only appear on the last set of reels. This will allow you to hold the left position, but it will hold the same on all the 10 reels. Despite the interesting set of reels, attractive symbols and perfect design from 2009, Ugga Bugga is known by something else. The Return to Player that this game offers is something that invites and holds the players on the reels. An amazing opportunity where 99.07% of the money is being returned to the players is offered by Playtech through this online video game, and it is something that you should not miss. To summarize, Playtech managed to make an online video slot game called Ugga Bugga where the players are constantly throwing in positive comments. The lovely features that it has, among the amazing % of RTP are features that you have to try and test your luck at. The fact that it is made in a land-based casino makes it more popular, and makes people want to stay on the reels for longer.